I haven't worn a maxi dress during this pregnancy...until now. I constantly heard how pregnant women loved wearing a maxi dress (anything loose, flowy and basically a onesie is a winner) but I just plain ol' avoided wearing one. I was thisclose to getting one from Rachel Pally but then I remembered this fab one I purchased from Banana Republic last summer. I never wore it since it was actually too long on me. I intended to get it hemmed but, life got the best of me and I never made a trip to the tailor. 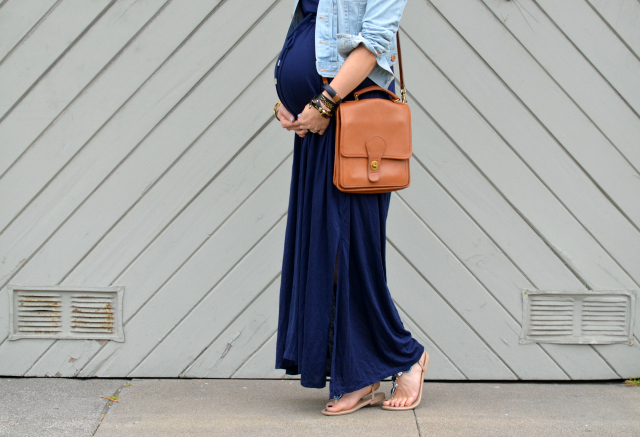 By luck, this maxi dress fit over my burgeoning belly and the extra length worked in my favor! 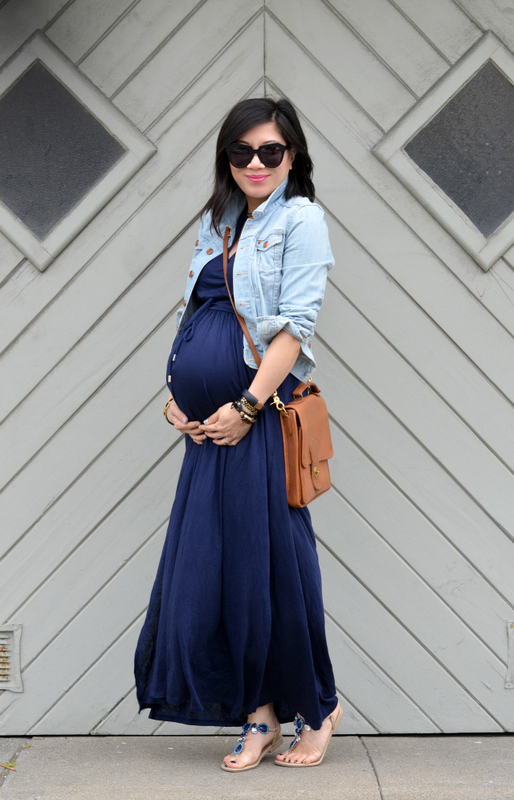 Now, based on experience, I can say maxi dresses are indeed perfect for pregnant women. You are looking so gorgeous! 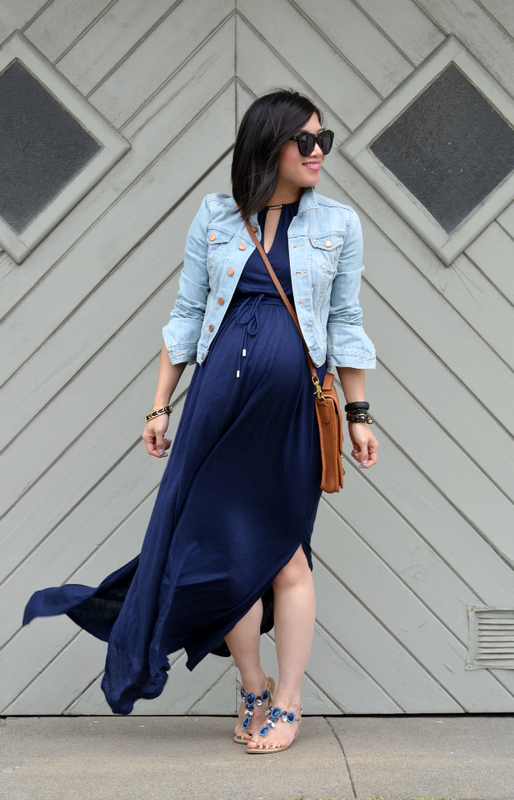 Nothing is better than a classic maxi dress, and I'm loving it with the jean jacket. I'm obsessed with the sandals, they are fabulous! This outfit is lovely! I think they are perfect too! so comfy! You look gorgeous! 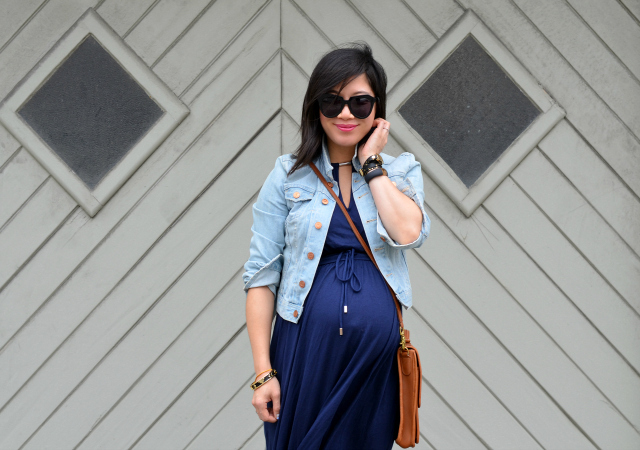 This maxi dress is so pretty on you, and I love it with the denim jacket! You look so adorable in this maxi, not to mention really really happy. OMGosh yes. I wore maxi dresses so much I think I have subconsciously boycotted them since I had the baby! You look adorable, of course, in yours! This maxi dress is adorable and that shade of blue is lovely on you Nancy! Aw love this! You look great! You look so lovely! I like the little drawstrings on this dress. It's really cute and it's also good that you can wear it post pregnancy as well (even if that means you'll have to hem it). That looks so good on you Nancy! I love your denim jacket, bag and those sandals. i love how the length worked out for you! it's a gorgeous dress and it looks lovely on you!! I am so loving this maxi dress over your bump Nancy. You look so gorgeous in this look. You really are glowing. Beautiful. looks like such a comfy dress for the baby bump, so pretty too! LOL..procrastination pays off for you this time!! Loving those beautiful sandals with this maxi. Oooh, this maxi dress is a gem! It works perfectly with your belly, haha I can see why pregnant women love them! I feel like that's what I'd live in. There ya go! You can just get it hemmed after the baby! This is the perfect spring combo, you can never go wrong with a denim jacket! !